Celtic goblet is a pewter vessel that features embossed designs and lettering from the Book of Kells. This Celtic goblet features pewter construction that is embossed with designs from the ancient Irish manuscript, the Book of Kells. Characteristic of this Kells goblet include ornately scripted letters. The pewter goblet holds 12 ounces and stands 6" tall. Celtic goblet is a pewter vessel that features lettering and designs from the Book of Kells. Celtic goblet features pewter construction that is enhanced with ornamentation from the Book of Kells. 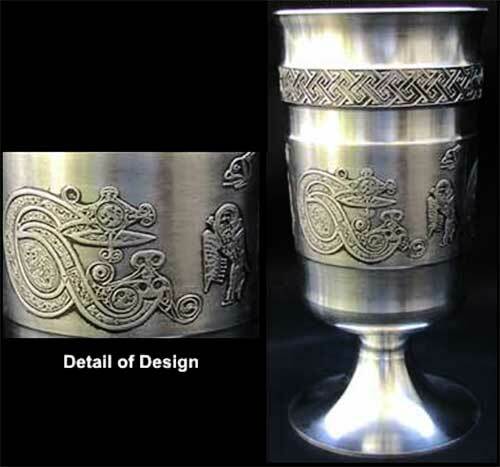 Celtic goblet is a pewter vessel that features embossed embellishments from the Book of Kells.